Radiator Repair - Parker Automotive Inc. The cooling system is designed to bring the engine to the proper temperature and to maintain the temperature there. It does that by using internal engine temperature to heat the coolant. Conversely, the radiator fluid (coolant) is cooled by air flow through the radiator. 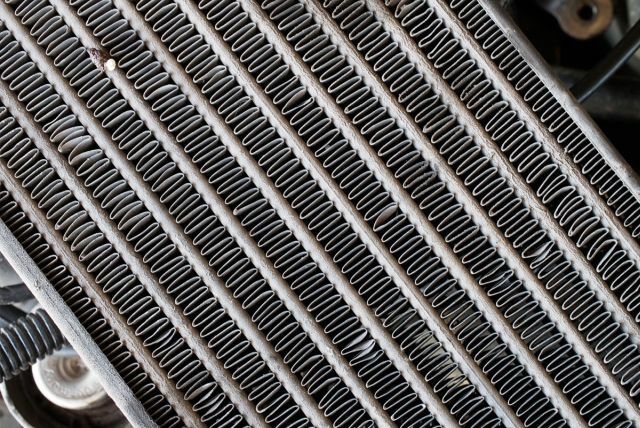 There are rows of thin capillaries in the radiator. When the vehicle isn’t moving, the cooling fan compensates by sucking air through the radiator. In order to maintain the cooling system, the fluid needs to be changed about once every 2 years or 30,000 miles. Over time the coolant loses its ability to protect the multiple components in the engine and cooling system. As the fluid gets older the pH goes up and the nitrates go down. The pH and the nitrates are what protect the system. Ironically, the radiator and cooling system are what provide the passenger interior with heat when needed. The heat in the radiator fluid goes to the heater core, then air is pushed over it on its way to the passenger cabin. Visible Coolant Leak – A noticeable antifreeze leak is an obvious sign of trouble. The coolant typically appears as a bright green liquid and often collects below the front of the car. White Exhaust Smoke – Large, puffy clouds of white smoke are a sign that your vehicle is burning up antifreeze in the combustion chamber. It indicates a leak in the motor, which requires immediate repair. Increasing Temperature Gauge – Although a rising temperature may point to a faulty thermostat, it could also be due to an issue with your cooling system. It’s best to have a technician look at the problem.